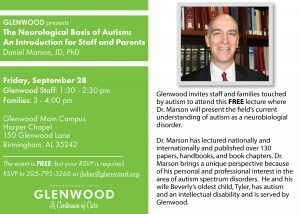 Glenwood Lecture: The Neurological Basis of Autism | Glenwood, Inc.
Glenwood invites staff and families touched by autism to attend a FREE lecture where Dr. Daniel Marson will present the field’s current understanding of autism as a neurobiological disorder. Dr. Marson has lecture nationally and internationally and published over 130 papers, handbooks, and book chapters. Dr. Marson brings a unique perspective because of his personal and professional interest in the area of autism spectrum disorders. He and his wife Beverly’s oldest child, Tyler, has autism and an intellectual disability and is served by Glenwood. The event is FREE, but your RSVP is required. RSVP to 205-795-3268 or jluker@glenwood.org. Glenwood Staff: 1:30 – 2:30 p.m. Families: 3:00 – 4:00 p.m.
Glenwood is a nonprofit organization incorporated in 1974 for the purpose of educating and treating individuals diagnosed with autism, behavioral health disorders and mental illnesses. Glenwood is devoted to helping individuals reach their full potential and be productive members of society. Glenwood's campus is located on 363 acres in Birmingham, Alabama.